Within the Tarpit Enclaves there exists a Library. Within that library lies billions of tomes, knowledge of untold millennia. And keeping an eye on these tomes exists the Librarians; bird-like creatures that watch over their chosen shelves with the dedication of monks, often caressing their books like mothers do their babes. So if the Librarians watch over the books, who watches over the Librarians? The answer to that lies within select burrows hidden beneath the floors, in the ceilings, or within the walls. They are mistaken often as discolored patches at first; strange shapes added to an otherwise black and tar-like visage of stone and wood. It isn't until an intruder attempts to steal a book or harm a Librarian that the entrances to the burrows are tossed aside and their occupants unleashed. They are the Tar Crabs; horrid creatures appearing like a monstrous cross between crustacean and man. These demons are mindless, horrific beasts; existing solely for the protection of the Librarians. Made from the very tar that they sustain themselves on, these deadly creatures attack with lightning speed that their size would otherwise deny. They rip apart their foes before dutifully picking up the remains and dragging them back into their dark burrows to become one with the tar with which they feed. Abilities: Tar Crabs are essentially gigantic bestial thugs. They are physically powerful; capable of moving with amazing speed. They are also strong; capable of crushing steel with their claws. 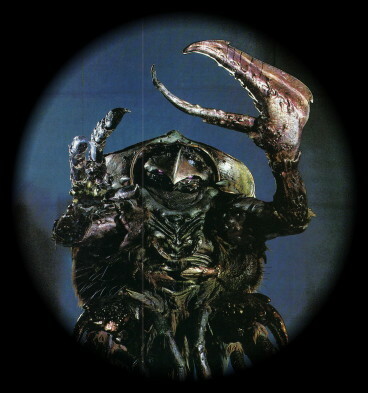 Their large claw which sits upon their left forearm can slice through the toughest of mortal substances. They are also covered in armor that is immune to basic attacks, and can withstand being nearly torn to shreds before they finally are slain. Unfortunately this armor keeps them from being too flexible, and as such they cannot do much against incredibly agile opponents.